The stylish Samara three-drawer cabinet is the charming answer to all your organizational needs. 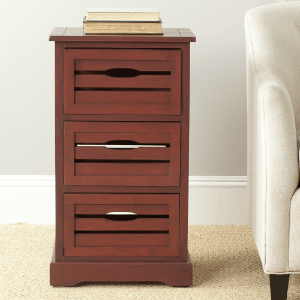 Crafted of 100-percent pine wood in cherry finish, its three drawers and clean lines make it at home in the kitchen, home office or craft room. Features: Color: Cherry Materials: Pine Wood Finish: Cherry Measures 29.5 inches high x 16.5 inches wide x 12.6 inches deep This product ships to you in one (1) box. Furniture arrives fully assembled.